JEITA Semiconductor design technical committee is aiming for merging the design technology of “semiconductor” and “system”. While invention and sales of electronic devices continue to happen, it is important to sometimes merge the technologies in the supply chain and plan out the product project. In order for this to happen, it is significant to distribute each individual technology. The IEEE Standard Format for LSI Package Board (LPB) Interoperable Design is an international standard that gives a role to represent the distribution of technologies. The Semiconductor design technical committee will base this international standard to research and develop the system design to attain the goal “Use of semiconductor in the system design” “Incorporate the requirements and constraints of the system into the semiconductor”. Through this activity, we will contribute to develop the semiconductor industry and electronics industry. 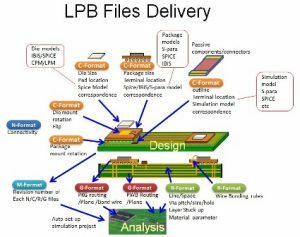 LPB is the interoperable design of LSI · package board. LPB aims to work closely together to finish competitive product design quickly. IEC 63055/IEEE2401-2015 is an international standard that we are promoting to distribute necessary information and design results related to LPB. Purchase from here.